eHealth Initiative and Foundation (eHI) convenes executives from every stakeholder group in healthcare to discuss, identify and share best practices to transform the delivery of healthcare using technology and innovation. eHI, and its coalition of members, focus on education, research, and advocacy to promote the use of sharing data to improve health care. 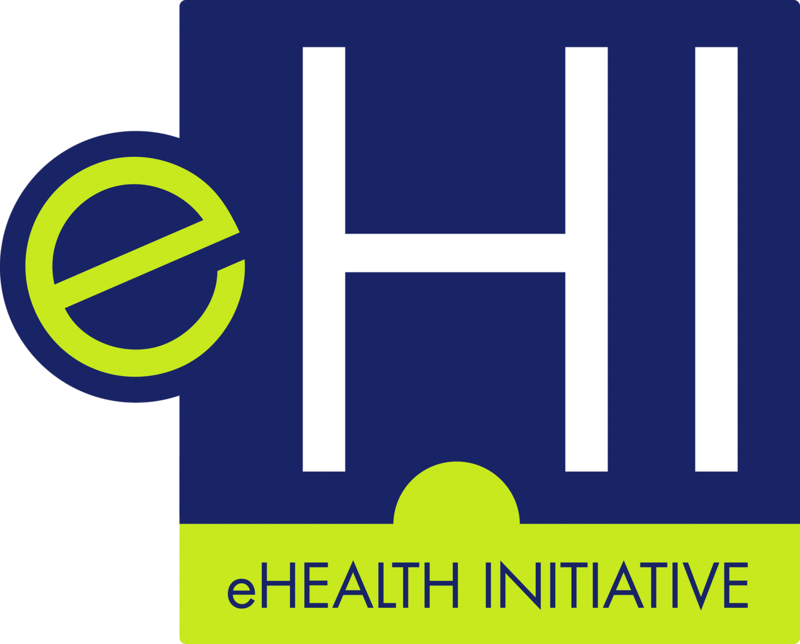 eHI serves as a clearinghouse, and has become the go-to resource for the industry through its eHealth Resource Center. Supports high quality and efficient patient care through the use of interoperable health IT and secure data exchange between and across all relevant stakeholders. Our current work is focused on these areas: Patient and Provider Technology Adoption, Data Analytics, Privacy & Security, and Interoperability. Working with our members in these key areas, we can positively impact healthcare by improving quality and reducing costs. Since 2001, eHI has “pushed the envelope” with healthcare executives across the nation, leading groundbreaking research and advocacy efforts. Our record speaks for itself. The results of our efforts can be found in the eHealth Resource Center. Some of our key initiatives are outlined below. From 2001-2003, eHI worked with the Markle Foundation on the Connecting for Health Initiative, helping to convene dozens of experts on interoperability issues. From 2003-2004, eHI led a national initiative on ePrescribing, and released a groundbreaking report, which helped contribute to the rapid adoption the technology by the private sector and policymakers. Since 2004, eHI has released an Annual Report on Health Information Exchange or Data Exchange that assesses the state of the field. In 2005, eHI identified the seven stages of development HIEs follow. This seven-stage framework has been widely embraced in analyses of health information exchange for over a decade. In 2005, eHI launched Connecting Communities, a rapidly growing coalition of leaders representing more than 250 state, regional, and community-based initiatives, focused on improving healthcare through health information exchange. In 2007, the eHealth Initiative Blueprint: Building Consensus for Common Action was released. The Blueprint represented multi-stakeholder consensus on a shared vision and a set of principles, strategies and actions for improving health and healthcare through information and information technology (IT). This type of work generated buy-in among the diverse stakeholder groups, and even subsequently resulted in a multi-stakeholder consensus legislation project that informed HITECH provisions of the American Recovery and Reinvestment Act (ARRA stimulus act) of 2009. Similar to previous landmark initiatives, the National Progress Report on eHealth (2010), represented multi-stakeholder consensus on a shared vision and a set of principles, strategies, and actions for improving health and healthcare through information and information technology across five key areas: engaging consumers; transforming care delivery; improving population health; aligning financial and other incentives; and managing privacy, security, and confidentiality. From 2011-2014, eHealth Initiative led national workgroups and produced a series of several groundbreaking reports on the use of social media, mobile health tools and other innovations to support Chronic Care. Beginning in 2011, eHI started surveying and analyzing accountable care organizations (ACOs), data analytics and population health efforts, releasing annual reports and surveys on the state of the field. In 2013, the Executive Advisory Board on Privacy and Security was formed. It provides a forum for over 40 Chief Privacy Officers and Chief Security Information Officers from payer, provider and pharmaceutical organizations to gather quarterly and discuss key concerns with policymakers. In 2014, eHealth Initiative spearheaded the 2020 Roadmap, a multi-stakeholder collaborative intended to support current leadership efforts, including those involving the Administration, Congress, and private sector organizations engaged in health IT and healthcare. The 2020 Roadmap process engaged over 200 executives from key organizations across the spectrum of healthcare as well as the leadership in the Department of Health and Human Services. The priorities outlined in the 2020 Roadmap provide a framework for much of our current work. In 2015, launched the Innovation Challenge and Summit, gathering submissions and comments from over 2,000 entrepreneurs and executives, matching entrepreneurs with established payer, providers and vendors in search of new products and strategies. In 2016 and 2017, eHI began interviewing provider executives and assessing the state of the field for genomics and precision medicine. In 2017, eHI is launching the Electronic Medication Adherence Collaborative, a multi-stakeholder initiative evaluating innovative solutions to improve outcomes and reduce costs. Working with our members, eHealth Initiative & Foundation will continue to positively impact healthcare by improving quality and reducing costs. No special interest group or single stakeholder can make an impact alone. Therefore, it is critical that leaders from all sectors of healthcare band together. Join us today.